Perhaps the most dramatic flying boat ever built was the giant Dornier Do X. Conceived by Dr. Claudius Dornier, the Do X design took seven years to complete and two years to build. 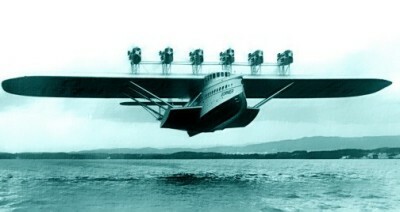 The giant flying boat was finally launched on July 12th 1929. Financed by the German transport ministry, the plane was built on the Swiss portion of Altenrhein in order to avoid the Allied Commission. When complete, the Do X was the largest, heaviest and most powerful aircraft in the world. On October 21st, the plane took off carrying 169 people consisting of 150 passengers, 10 crew and 9 stowaways, easily breaking the world record for the number of people aboard a flight. A record that would not be tested for 15 years. Weighing 48 tons, the plane taxied for 50 seconds before slowly ascending to only 650 feet. It flew for 40 minutes at a maximum speed of 105 mph finally landing on Lake Constance. The luxurious accommodations and service on the Do X were in keeping with the standards of transatlantic liners. Several cabins on the main deck held passengers comfortably on 32 double seats and two single seats, while the cockpit, captain's cabin, navigational office, engine control room and radio office could be found on the upper deck along with quarters for the 14 man crew. The lower deck held fuel and stores. The plane was enormous with a wingspan of 157 feet 5 inches, a length of 134 feet 2 inches and a height of 33 feet. As a result of the massiveness of the plane, passengers were asked to crowd together on one side to help the flying boat make turns! The plane had an all-metal hull with wings comprised of a metal framework covered in fabric. 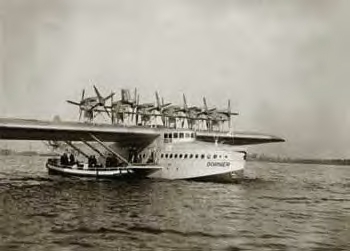 Powered by twelve 525 horsepower Siemens Jupiter engines mounted in tandem on the wing, the plane was designed carry 66 passengers on long distances or 100 on short trips. The Jupiter engines were only able to lift the plane to an altitude of 1,400 feet, preventing the plane from making trans-Atlantic crossings. After completing 103 flights in 1930, the plane was refitted with water-cooled Curtiss Conqueror engines at 610 horsepower each. On the August 4, 1930 flight, newly fitted with Curtiss engines, the plane reached 1,650 feet, a height that was deemed suitable to cross the Atlantic. The Do X took off from Freidrichshafen, Germany on November 2, 1930 commencing its trans-Atlantic proving flight. The route took the Do X to Lisbon, down the Western African coast, across the Atlantic to South America, and north to the United States finally reaching New York on August 27, 1931. The final leg of the trip began again on May 21, 1932 from New York to Newfoundland, on to the Azores, and finally to Berlin where the Do X was met by a cheering crowd of 200,000. Two other Do X planes, the Do X2 and X3, were completed and delivered to Italy in 1931. Because of their monstrous weight, all three planes were deemed unsuitable for commercial flight. The Do X was retired to the Berlin Air Museum in 1934 and was destroyed by an allied air raid in 1943. The X2 and X3 were used primarily by the Italian military for prestige flights but were quickly retired from service in 1934. While the Do X was not a commercial success, it was an important experiment in early aviation. It remains, by its sheer physical strength and size, one of the most extraordinary seaplanes in history.